Coronation Street character Clayton does not have many fans and that include the other inmates. He is serving a prison sentence for killing David’s wife Kylie. Shona visits her killer son in prison and finds out that he is being bullied by other inmates. At first, he asks his mother if she can find a way to have him moved to an open prison but that didn’t work out. In order to avoid being beaten up all the time, Clayton comes up with a plan and enlists the help of his mom. Unfortunately, Shona refuses to play a part in Clayton’s scheme to have her smuggle drugs inside. According to Coronation Street spoilers, her answer does not sit well with her son. Because of her refusal, someone breaks inside Shona and David’s home. The intruder films the unsuspecting couple while they sleep. 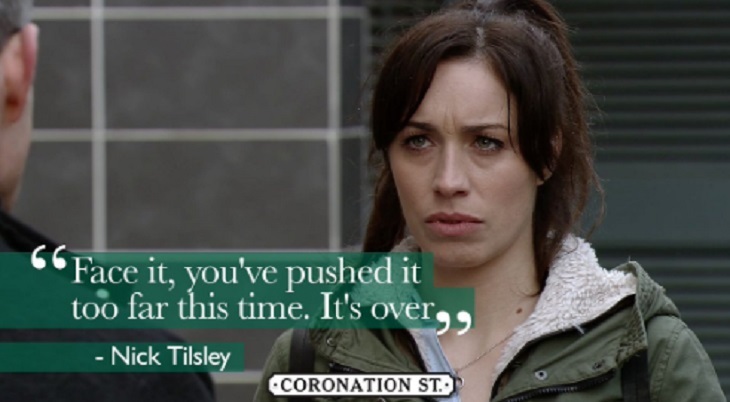 Shona will also have a run in with some thugs, who are most likely connected with Clayton’s problem in prison. She is forced to deal with the crisis alone and cannot tell David because of what her son did to his wife. Viewers may recall that Clayton stabbed Kylie when she tried to intervene in a fight involving Clayton and his former friend Gemma. Her death left David devastated who even tried to get revenge against Clayton, twice. It was even harder for him when he found out that he’s been dating the mom of his wife’s killer but still decided to make their relationship work. Shona tries to keep everything that’s been going on to herself. However, David confronts and asks her why Clayton is in the hospital and all beaten up. She’s reluctant to tell him about Clayton’s problem in prison after all he’s done to him. Meanwhile, Coronation Street pictures reveal, Clayton will escape prison and causes a major threat to the life of Shona. Photos revealed Clayton holding a knife at Shona as he takes her hostage. Fans will find out if he will be claiming another life. If so, will it be Shona or someone else?